· Reservoirs: the largest will flood 57 square kilometres of land, and a further 8 9 smaller ones will submerge another 10-20 square kilometres. · The dams: the biggest will be 190m high, 770m long; 3 medium-sized dams 32m high and 1000m long. In addition 6-7 smaller dams will be built. · The water will be diverted to the turbines through a 40 kilometre long tunnel/gallery. 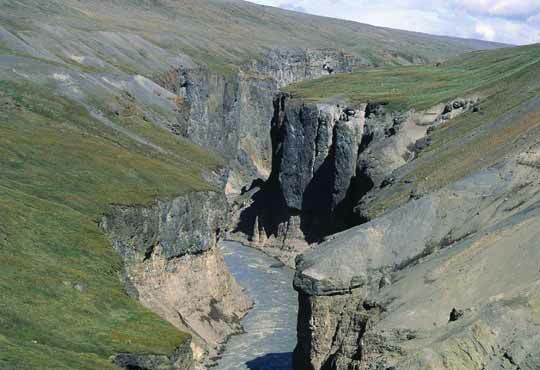 · The third longest glacial river - Joekulsa a Bru, Husey - which has carved out for itself one of the deepest and most attractive canyons in Europe, will be converted to an insignificant stream. · The diversion of the waters into another glacial river will result in immense changes to the Lagarfljot glacial lake. Its natural drainage will have to be artificially enlarged and the huge estuary delta will have to be reconstructed. · Altogether, 3,000 square kilometres or 3% of Icelands total landmass will be affected by this irreversible intervention in the environment. The area affected, where the natural environment and habitats will be destroyed, extends from the edge of the Vatnajoekull Glacier to the estuary of the Héraðsflói glacial river. · A total of 32 square kilometres of land now covered with vegetation will be submerged forever. The soil erosion in the central highlands is on of the greatest problems Iceland has to cope with and it must be feared that the planned reservoirs where the deposits carried by the glacial rivers will end up some 10 million metric tons per year - could pose a danger when the water level in the reservoir sinks. This will occur in winter, when the water reserves will be drawn on. This time of year for the wildest storms and even more vegetation will be threatened and covered by the masses of sand and dust carried by the violent winds. · A unique former geothermal region will be flooded. · Flora and fauna: The affected area is one of the few regions in Iceland where the soil and vegetation are still more or less intact. Opponents of the project point out that the project would have unforeseeable consequences for the water table. This part of Iceland is the home of the reindeer whose summer pastures would be flooded. Some 400-600 seals breed every year on the natural beaches. Pintail (Anas acuta) - 100 pairs; 20 % of the total Icelandic population ! Arctic Skua (Stercorarius parasiticus) - some 1300 breeding pairs. Will Norsk Hydro Support Wilderness Destruction?